International driver with parking eye appeal? My relative from the US was driving my car a few weeks ago and got a parking eye ticket for overstaying. The car had broken down and it was a genuine reason. 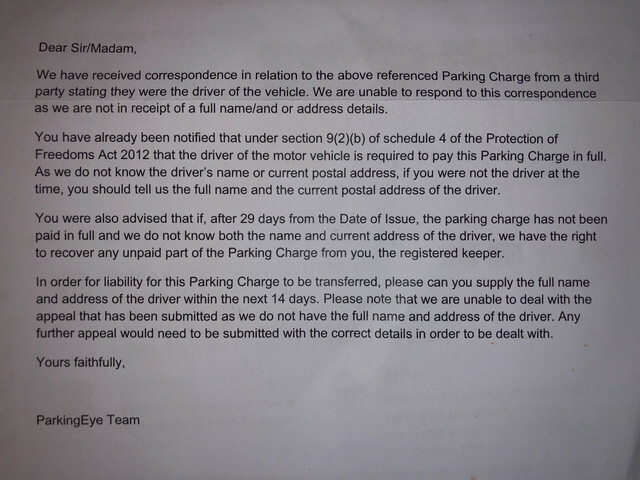 So I appealed it - I never said who was driving after reading here it was good to be vague. So I was surprised to get the attached letter - which says that they can’t respond to the appeal as they don’t know who the driver was! And that if I provide a name and address I would discharge my responsibilities to pay the charge. My relative is obviously international - so what happens when I provide their name and address ? What will parking eye do? Are they going to chase someone in the US? Or any other country? They may write letters, otherwise they are completely toothless. That’s why it’s the one time you name a driver. Some will claim they can hold the keeper liable if the driver is overseas, this is of course complete Horses doo-daa’s. The US is outside of jurisdiction. All you are required to do is provide a name and address for for the driver. It's not your fault it's beyond the reach of PE. Nice of them to confirm that your liability will be discharged. Some time ago daughter who lives and works abroad got a ticket from PE. When I told them this neither of us heard another cheep from them. I do credit PE with some degree of grey matter, knowing when a lost cause is no longer worth pursuing. Compare with the terminally stupid variety of PPC, who are unlikely to even understand the concept that pursuing someone who is resident abroad has no likelihood of success. So what we are saying is that technically this is a way out of a private parking ticket that they can’t get around. They could send all the letters they want to the other country but they have no ability to get the money back - and can’t go after the keeper of the vehicle? The keeper can only be liable for the drivers actions IF the driver isn’t named (along with other requirements), once the driver is named the keeper has no liability. If the driver is out of jurisdiction and hence ‘untouchable ‘ it’s game over for the parking company. 'Lying' could get one into grief. Yes, it is a get out of jail free card, but if PE suspects (and can prove) that the RK is not telling the truth, then they can simply persue the RK, as no name and servicable address will have been provided. They have already acknowledged that the RK was not the driver and so they are stuffed when you name the driver's address. Easy win. Happy days! Sorry to be pedantic. Legally the US is not out of jurisdiction and PPC/Parking Eye can pursue it but they will need to PAY ALL legal fees to do this, hence it is not worth pursuing. I am speculating but with Brexit even in Europe it is unlikely a UK-PPC will pursue a foreign address given the costs. Its a loophole my friends would use at university by giving Chinese names and addresses. Unless you parked at an embassy/consulate car park and gave an address belonging to that foreign country. I have a foreign friend whom did this and they were pursued when they got back home so they paid - although she had the added pressure it would have potentially affected her job if she did not. Remember to point out they have acknowledged you/RK is not the driver. The USA is out of the MoneyClaims online jurisdiction, however, which may be enough. You can only use this service to claim against a person or organisation with an address in England or Wales. Depending on where you’ll be sending the claim, you might be able to claim using a paper form. No, the claim would be against the RK as RK, not as driver, so the identity or address of the driver would then be irrelevant. POFA 2012 allows the RK to be pursued in place of the driver for the transgressions of the driver, provided certain conditions are met, one of which being the claimant not having the proper contact details of the driver. If the claimant can prove that the driver details provided by the RK were bogus, then the claimant would not have the driver's correct details, and so would still "not know" the correct details. No. In this case the RK knows the driver and should name him/her and let the PPC have fun trying to lay a finger on the driver. The driver details will not be 'bogus'. King - incorrect. A resident in the US is outside the jurisdiction of the England and Wales court, by definition. They would be required to obtain specific permission to raise a claim against a US resident, and cannot use MCOL to do so. 5 (b )is unable to take steps to enforce that requirement against the driver because the creditor does not know both the name of the driver and a current address for service for the driver. Parking has name and address of driver (I hope) then there can be no claim on the keeper. The Act makes o mention of the serviceable address having to be in the England or Wales. Unfortunately that same week my relative got another ticket at another location. I sent the same appeal to them. This time they totally ignored the fact I said I wasn’t the driver and started talking about the signage. 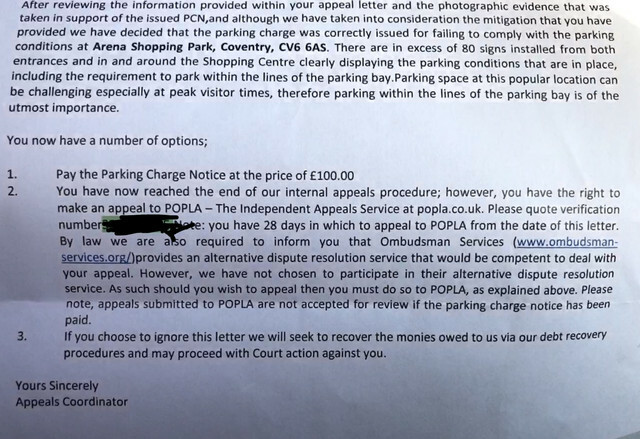 I assume that I can easily appeal to popla now because they don’t know who was driving and they ignored my appeal where I said I wasn’t? They didn’t give me a chance to say who was driving or even acknowledge it. It looks like an easy win for me? OP needs to provide more information. We may be confusing what the OP told PE (as RK) with what the OP has told us about the driver. Naming the driver would absolve the RK; it would land the driver in it (but there may not be much "it", given the driver's apparent location). To clarify - for that week I let me cousin from the US drive the car. We insured him on it. However the car has an intermittent issue - the engine lights comes on - and when it does the car cannot be driven until it clears. Audi has been unable to fix the issue. During the week he was here that issue happened twice. In the first case it was an overstay as he had been shopping and when this happened it ticked over the 3 hour limit. I provided the first PPC with his details. The second ticket was for not parking in the bay; which occurred because the light turned on and he pulled over and shut the car off. And in the time that he waited a “warden” came over. The appeal I made was exactly the same as the first ticket. I made it clear I was not driving. However the first appeal letter they asked for the drivers details. This second letter they ignored that fact. They also ignored the fact the car broke down. I can provide evidence from Audi of the issue and provide to POPLA the drivers details... so surely they should accept the appeal? Does that mean I can appeal on the grounds I was not the driver and that they did not ask? Or something similar...? What’s the best way?